There are few things more pleasant than seeing, feeling and smelling the vast richness of life that accompanies springtime on the farm. The layer chickens particularly love this time of year. Foraging for bugs, leafy weeds, and a multitude of living treasures --- it's a slice of chicken heaven. 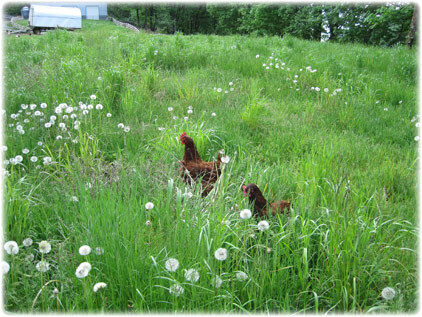 When chickens are allowed to forage year-round on pasture, their diet will vary depending on what species of plants and bugs are available. For example, right now the chickens are gorging on new grass and insects, resulting in a darker yolk. In winter, their yolks are a lighter color due to the dormant grasses and fewer number of bugs. Some seasons have darker yolks, some firmer whites --- it's all part of the intended life rhythm. And so we adapt our expectations to fit the natural cycle, rather than forcing the chicken to produce a standardized "product". And here's another thing: We don't keep our layer chickens in confined areas, but rather give them freedom to roam throughout the pastures. Our mobile coops shuttle the hens around the farm, resulting in a constant supply of whatever is growing. This would be impossible to do on a large-scale, which is why you won't find eggs like ours in any store. Retail stores want "volume" suppliers, "standardized" products, and rigid consistency. That's why you need to get in touch with local, organic family-farms. Buy direct. Know your farmer. Connect with the source. Understand your food. And reap the benefits of healthy land, healthy animals, and a healthy planet.